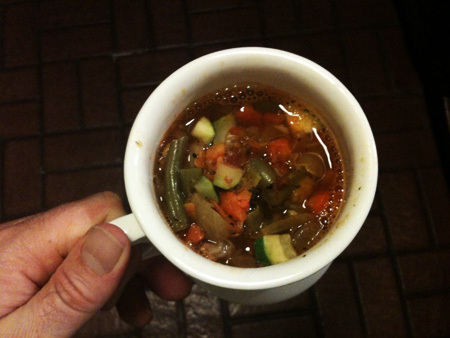 Hitting the road running with Weight Watchers famous 0 point garden veggie soup! So yesterday my good friend Shannyn and I got into a nice discussion about calories and weight watchers point system. 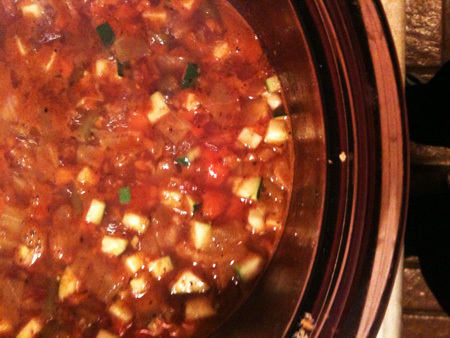 During that conversation and looking at recipes we came across the famous Weight Watchers 0 point garden vegetable soup. She told me that I had to try it, so I did. I have to say it was delightful. After I made the soup I came to a couple conclusions. A) Don’t use frozen green beans. The fresh green beans at food for less were looking pretty gnarly so I went with the frozen. Bad idea, J said she could taste the “frozen” on the green beans. B) If you have someone who doesn’t like onions you can’t leave out the onions but keep the cabbage because cabbage when stewed comes out with a similar texture to stewed onions and this recipe has a lot of cabbage. Solution, corn and pasta (pasta cooked separately then stirred in near the end just to warm.) If you need a little meat some chicken would be nice. This will obviously alter the amount of WW points C) I think a squeeze of lime would be nice near the end. This recipe was found at Dotti’s weight loss zone which is and awesome site for getting basic calorie and other nutritional values of most restaurants. In large saucepan, sprayed with nonstick cooking spray, sauté carrot, onion, and garlic over low heat until softened, about 5 minutes. Add broth, cabbage, beans, tomato paste, basil, oregano and salt; bring to a boil. Lower heat and simmer, covered, about 15 minutes or until beans are tender. Stir in zucchini and heat 3 – 4 minutes. Serve hot. 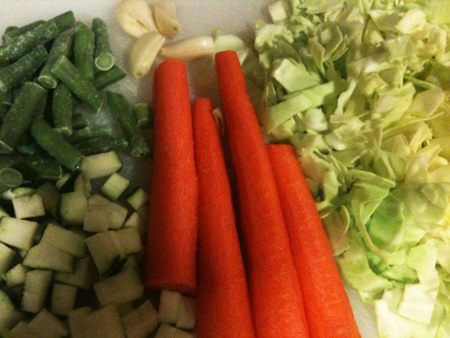 This entry was posted in Food and tagged cabbage, carrot, low calorie, soup, vegetarian, weight watchers, zucchini. Bookmark the permalink. Both comments and trackbacks are currently closed.